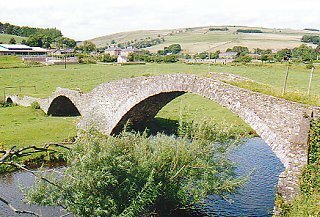 Located on the Gala Water 7 miles (11 km) north of Galashiels, Stow is in the old county of Midlothian near the Moorfoot Hills. Formerly one of Scotland's original seats of sanctuary, it is a quiet village which was once linked to St Andrews and was the location of its Bishop's summer residence. Stow's Old Kirk (late 15th Century) was built around the Church of St Mary, consecrated in 1242 and supposedly holding one of her relics. An even older Chapel of Our Lady was built to the south near the Lady's Well, allegedly by King Arthur. A more recent church was built in the 1870s. The Pack-Horse Bridge (1654) was constructed as a subscription bridge by the church with a low parapet to allow burdened horses to cross in safety. It was restored by Scottish Borders Council in 2002. Stow had a railway station between 1848 and 1969, and a new station was built to serve a rejuvenated Borders Railway in 2015. Nearby stands Bowland (1811), a castellated mansion, and Bow Castle, an ancient broch similar to Torwoodlee (also in Stow Parish) and Edin's Hall near Abbey St Bathans in Berwickshire.